The grand jury deliberating Michael Brown's death decided yesterday not to press charges against police officer Darren Wilson. While, given the evidence that has been released to the public, this is a reasonable conclusion, hell immediately broke loose in Ferguson. Transiting Mars and transiting Jupiter forming challenging aspects with Ferguson's Mars: action riled-up and exacerbated. Transiting Jupiter probably conjunct Ferguson's Moon in Leo: racial identity of the population, blown up. Transiting Pluto quincunx Ferguson's Pluto: destructive energies unleashed. Transiting Pluto sextile Ferguson's Pallas: the temporary removal or weakening of ethical barriers against violence. 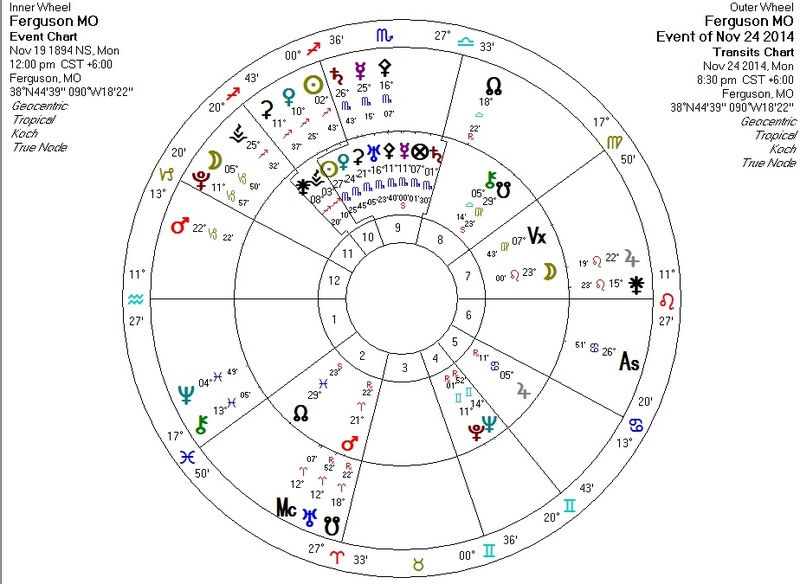 Similar transits apply to the USA chart, reflecting nationwide protests and riots. Black men are murdered fairly regularly by police overstepping their authority. In those cases, which are clearly unwarranted killings, the mainstream press is silent. Instead, they choose to incite race-war by hyping up cases like this one and the Trayvon Martin case in which there is clearly a reasonable doubt as to the guilt of the shooter. This is not just irresponsible: it's destructively criminal. It's also driving Americans in droves to the likes of Infowars, RT, and Drudge. I am one of these.